Authors: Rushton A, Rivett D, Carlesso L, Flynn T, Hing W, Kerry R.
This document presents a clinical reasoning framework for best practice developed by an international collaboration of the standards committee of the International Federation of Orthopaedic Manipulative Physical Therapists (IFOMPT) and international subject matter experts. This framework was informed by the consensus forum at the IFOMPT International Conference in Rotterdam (June 2008) where nominated experts from each Member Organisation of IFOMPT were invited to participate. Prior to this forum, the issues central to this document were explored through oral presentations and discussion at the World Confederation for Physical Therapy (WCPT) International Congress (June 2007, Vancouver) and in Rotterdam. Drafts of the document have been developed since 2008 through an iterative consultative process with experts and Member Organisations. This document has been developed as a resource to educate members of the Member Organisations of IFOMPT, physical therapists internationally, and through physical therapists, the public. The framework has subsequently been agreed on by all Member Organisations of IFOMPT. It has been a challenging process to produce an international agreed document, emphasising the need for Member Organisations of IFOMPT to operationalise the framework in line with their national legislation / practice. Please see www.ifompt.org for all information. Promote and maintain the high standards of specialist education and clinical practice in manual/musculoskeletal physiotherapists. Promote and facilitate evidence based practice and research amongst its members. Communicate widely the purpose and level of the specialisation of manual/musculoskeletal physiotherapists amongst physiotherapists, other healthcare disciplines and the general public. Work towards international unity/conformity of educational standards of practice amongst manual/musculoskeletal physiotherapists. Communicate and collaborate effectively with individuals within the organisation and with other organisations. The Standards Committee of IFOMPT is a sub-committee of the Executive Committee and responsible for advising the Executive on educational issues and maintaining standards. The Standards Document is the guideline document which IFOMPT provides for groups of Manual Therapists who wish to seek membership of IFOMPT through the creation of postgraduate educational programmes in Orthopaedic Manual Therapy (OMT). Part A of the Standards Document details the educational standards. OMT is a specialised area of physiotherapy / physical therapy for the management of neuro-musculo-skeletal conditions, based on clinical reasoning, using highly specific treatment approaches including manual techniques and therapeutic exercises. OMT also encompasses, and is driven by, the available scientific and clinical evidence and the biopsychosocial framework of each individual patient. OMT interventions for the cervical spine addressed through this framework include: manipulation, mobilisation and exercise. Attention is focused to techniques occurring in end range positions of the cervical spine, during mobilisation, manipulation and exercise interventions. The framework is based on best available evidence at the time of writing. It is designed to be used in conjunction with the IFOMPT Standards that define postgraduate best practice in OMT internationally. Central to this framework are sound clinical reasoning and evidence based practice. Within the cervical spine, events and presentations of CAD are rare, but are an important consideration as part of an OMT assessment. Arterial dissection (and other vascular) presentations are fairly recognisable if the appropriate questions are asked during the patient history, if interpretation of elicited data enables recognition of this potential, and if the physical examination can be adapted to explore any potential vasculogenic hypothesis further. The framework is therefore reflective of best practice and aims to place risk in an appropriate context that is informed by the evidence. In this context, the framework considers ischaemic and non-ischaemic presentations to identify risk, prior to overt symptoms in a patient presenting for cervical management. An important underlying principle of the framework is that physical therapists cannot rely on the results of only one test to draw conclusions, and therefore development of an understanding of the patient’s presentation following an informed, planned and individualised assessment is essential. There are multiple sources of information available from the process of patient assessment to improve the confidence of estimating the probability of CAD. Data available to inform clinical reasoning will improve and change with ongoing research. 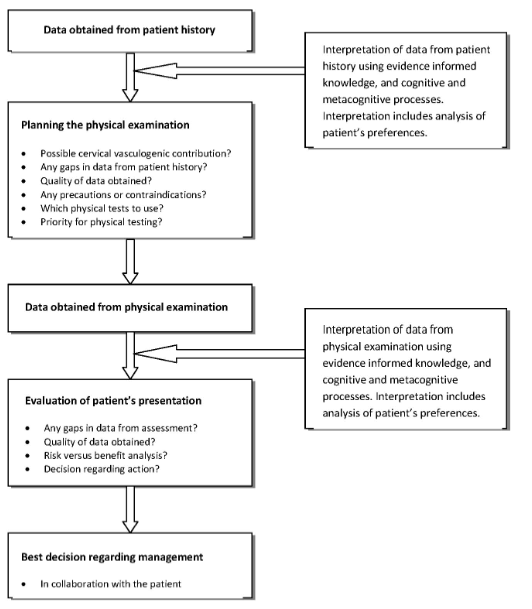 This framework therefore encourages physical therapists to critically read the current literature to enable support for their clinical decisions, rather than provide specific data prescriptive guidance, as the evidence base for this is not available. The framework is intended to be informative and not prescriptive, and aims to enhance the physical therapist’s clinical reasoning as part of the process of patient assessment and treatment. The framework is intended as simple and flexible. The physical therapist should be able to apply it to their individual patients thereby facilitating patient centred-practice. Musculoskeletal Association of Chartered Physiotherapists, United Kingdom (formerly the Manipulation Association of Chartered Physiotherapists).